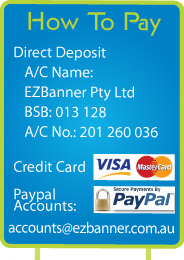 EZBanner is a leading online Australian Display and Print company, providing top quality display stands and other products at wholesale prices. Read more..
As direct importers, we are constantly stocked with hundreds of display products, ready for same-day dispatch to anywhere in Australia. Our online print services are powered by a HP Latex large format printer and HP Flatbed printer, so we can provide your business with top quality printing and a quick turnaround. With EZBanner's range, it's easier than ever to make your business stand out from the crowd, particularly at exhibitions where numerous competitors are vying for attention. We offer a full range of products especially designed to attract maximum attention to your business. From retail display stands, clip frames, exhibition stands, and promotion tables, to teardrop flags, light boxes and roll up banners, our products will take your business to the next level! Our display stands are an effective promotional solution for both indoor and outdoor exhibitions. Constructed from durable materials and with high visibility, they can attract clients and increase awareness of your business. Another great exhibition product to consider is a brochure holder to provide a neat and tidy way of presenting and organising promotional literature. Able to hold an assortment of A3 and A4 pamphlets, brochure holders are a highly effective way of attracting potential clients and prompting them to take information without any obligations. Your business will then remain on the minds of clients when they read the brochure after leaving the exhibition. While EZBanner is based in Melbourne, we provide shipping of our display stands Australia wide, including to Sydney, Brisbane, Perth, Adelaide, Canberra, and the Gold Coast. Because we value our clients' time, we strive to have a fast turnaround time. Items which do not include print are generally dispatched within 1 to 2 business days after your payment has cleared. Items that do include print are dispatched within 5 to 7 days after your artwork is approved and your payment has cleared. For added convenience, we provide a unique tracking number for each shipment, allowing you to trace your delivery throughout the process. Your order should arrive in 3 to 5 business days. Discover how EZBanner can increase the visibility of your business with display and exhibition stands. For an obligation free quote or to order now, call us on 1300 105 549 or send us an email at sales@ezbanner.com.au for a prompt reply. Hide this content.